Quite upset when drawing this caricature. Not because of the client. Just that I can't escape the fate of working when everyone is resting or enjoying themselves on this public holiday.... and this is the beginning of a new year! Sigh...... No choice. It is my job. Think I need better time management. 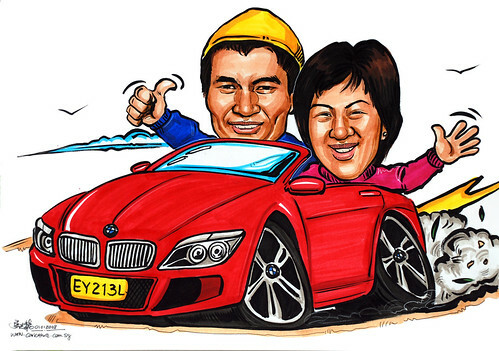 Anyway, back to the caricature, it is meant for the 25th anninversary gift for this couple. 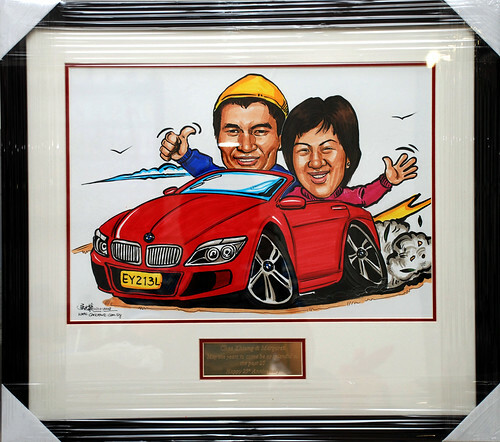 The client who ordered this artwork, requested to have them in a convertible BMW. Metal inscription and frame to be done at a later date, as there isn't enough time for it. Frame and inscription done on 15th Jan 2008.